Mounting/pivot bracket for saucer eject and ball server/release kicker arms. Also sometimes called a cam bracket. Used on many Bally and Williams games. This is a LEFT-HAND mount unit, which is less common. For right-hand mount, use part # A-8268-2. NOTE: This is the correct part for the saucer kickout on High Speed. Game manual for High Speed has a misprint and incorrectly lists a right-hand pivot as being used on the saucer kickout. Please verify that this is the correct part your game needs before you order. Pivot pin is 1/4-inch diameter and uses a 1/4-inch e-clip. NOTE: This is the LONG bracket used for saucer/eject and ball server/release kickers. 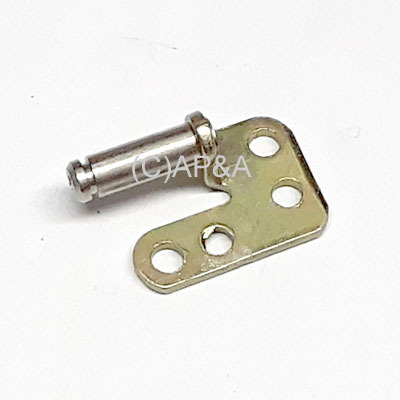 Length of pivot pin on this bracket is approx. 3/4 inches long. This bracket WILL NOT WORK for slingshot bumper kickers (Williams assembly # B-7573, B-8055, and similar) that require a shorter right-hand pin (approx 3/8-inch). For the shorter right-hand bracket, use part # A-17810. Short bracket is not available in left-hand mount.